Infinite City is a tile laying game. The first thing to strike you is that the rules are very, very short. This definitely appealed to me but the short rules do not mean the game is shallow. 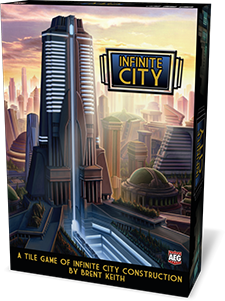 The goal of Infinite City is to score as many points as possible and points are scored depending upon which tiles your markers are on at the end of the game. To set-up, five tiles are placed face-down on the table in a cross shape and each player is given 15 markers of their colour and dealt a hand of 5 tiles, which they keep hidden from the other players.